Intermediate Western Rider Levels covering speed and performance classes. 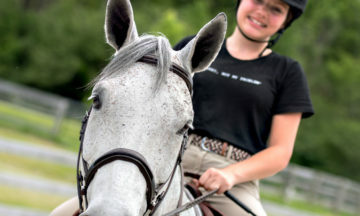 The Learn to Ride program is designed to be guided by a Certified Instructor or Coach, to ensure that the concepts are clearly understood before the rider progresses to more challenging levels. The program provides an opportunity for rider to progress, demonstrating their skills through a series of increasingly complex written tests, interviews and under-saddle jump and flat tests. 3. Determine the level you want to achieve. Start at level 1 and work your way through or “Challenge”. Challenging-a-Level. 4. Visit the Equestrian Canada E-Store to purchase either the Learn to Ride English Manual(s) or Learn to Ride Western Manuals. You may also wish to purchase the Stable Management in Canada book. 5. Contact a current and certified Equestrian Canada instructor/coach to begin training for the exams. Click here to find a certified instructor/coach. 6. When your instructor/coach feels you are ready, they may be able to administer the exam to you if they have completed the necessary training or some exams require you to use a coach other than your regular coach. Contact c.szafranski@ontarioequestrian.ca to receive a list of approved Learn to Ride Evaluators near you. 9. You keep working towards the next Rider Level!